What a wonderful prize I won at the end of National Family History Month in 2014; a year's subscription to Ancestry. As I had only been researching my family history for one year at that stage, I was doubly delighted. I subscribed to the Ancestry and AncestryAU YouTube channels and watched many hours of instructional videos, spent endless days teaching myself how to search effectively using a wide range of strategies and variations in search techniques. My library background served me well with diverse database research skills developed over many years. I used the card catalogue for Australia as well as the variety of search forms available. I investigated the contents and year coverage of a wide range of databases contained within Ancestry. No point in searching for something that is not there. The company certainly has a wealth of resources and if you are lucky enough to have ancestors from the United Kingdom, Europe, the USA or Canada there are currently more than 32 467 databases to explore with more being added and updated regularly. My ancestors are mainly from Ireland's southern counties and they migrated directly to South Australia in the 1840s and 1850s so while there are useful records in the Ancestry collections they are relatively few in number in comparison to other places in the world. Some of the records available for Ireland and South Australia I had already sourced elsewhere. I had much greater success with my husband's ancestors, some of whom arrived in Australia through NSW and Victoria. I am very grateful to Ancestry Australia for sponsoring NFHM and awarding such a prize which has given me the opportunity to help many other family historians in the local library through my newly acquired knowledge. However it is time for me to say farewell to Ancestry for now, as I pursue diverse avenues for my research. For relative beginners like me, the wealth of resources compiled at Cyndi's list is an excellent starting point. A family member recently asked "Is it really true that you just put in a name and let Ancestry guide you?" A seasoned researcher will know this is a simplification at best and quite misleading for a novice. Advertising is what it is - advertising, designed to sell product. The large genealogy companies do us a service by providing access to digitised resources but it is up to each consumer to evaluate his or her specific needs. Some companies offer conditional free trials, and for me a lucky prize afforded that opportunity. Thank you Ancestry I am pleased that my local library and genealogy society both have subscriptions that I can use as and when needed. There is no doubt that at some stage when my genealogy budget determines I will be back. For those looking for South Australian sources, some sites are compiled on my Pinterest board. In the spirit of contributing, volunteering and not without a sense of personal satisfaction, I have been text correcting digitised newspapers in Trove since my retirement from paid work. These papers provide an important window into the history of our country, its people and places. It is interesting to read of past times and extra entertainment is provided through some very hilarious interpretations of text rendered by the OCR process. Some months I may correct many lines and other months very little. The beauty is that it is always there and in a spare moment one can make a difference. Correcting the OCR text makes changes in the overall database and so improves the search. Trove provides simple, clear instructions in the Help Centre. Anyone can create a user profile to correct text and comment on articles. I started by correcting birth, marriage and death notices for my family history research then I found wedding and obituary articles. I simply had to correct these, amongst many others is this quite detailed report of my parents’ wedding. Soon I was lured into regional newspapers in the area where I had spent my early years. Many of the people and places mentioned in articles were known to me. The advantage of correcting a local newspaper, is that one is likely to have quite an extensive background knowledge, so text correcting is easier when dealing with the familiar. Other correctors choose a theme or particular interest. Trove put some questions to its top text correctors to find out what they correct and why, Read their responses on the Trove blog. When a user is logged in, Trove keeps track of how many lines of text are corrected. Here’s a screen clipping of the Hall o’ fame ranking as at 28 December 2015. That was the day I hit 1200th in the list. I’m wondering how far I can creep up that list in 2016 or indeed can I stay in the top 1200 as others continue their corrections. That’s my New Year challenge, I’ll check back December. Use the zoom function in your browser (CTRL+ or CMD+) rather than the Trove zoom function to enlarge the text to be edited as well as the newspaper article. 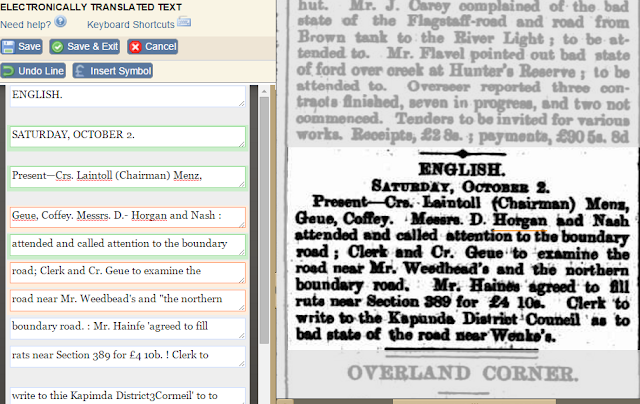 The Trove zoom can then be used to further enhance the newspaper article. Have a second Trove tab open to check for similar names or difficult words. In the article below it was difficult to determine whether the name was Geue or Gene. A quick search in the other tab revealed that families of Geues were living in the local area at the time of this article. Similarly I searched for Weedhead and Weedbead before determining the other difficult to read name was Woodhead. This Time-Date calendar lets one check the date on a specific day mentioned, so if an article mentions Monday 2? December 1849 where the ? is an unreadable character, the calendar helps determine the date was the 24th. Save every few lines corrected, better to have saved than lost through either a computer mishap or a connection glitch. Further guidelines by the top text correctors are provided here. View completed text correction on the Text corrections tab of your User Profile. Good to see that the ruts not rats were to be filled! Happy text correcting, hope to see you soon in the Hall o’ fame.